You are here: Home 2012 August How Private VLANs Work? It’s simple to explain What Private VLAN is, but Cisco’s implemenation and configuration steps are a bit confusing – with all the “mappings” and “associations” stuff. Here we will talk about Private VLAN and how private VLANs work. Firstly, let’s check the concept of VLAN as a broadcast domain. What Private VLANs (PVANs) do, is split the domain into multiple isolated broadcast subdomains. It’s a simple nesting concept – VLANs inside a VLAN. As we know, Ethernet VLANs are not allowed to communicate directly; they need L3 device to forward packets between broadcast domains. The same concept applies to PVLANS – since the subdomains are isolated at level 2, they need to communicate using an upper level (L3 and packet forwarding) entity – such as router. However, there is difference here. Regular VLANs usually correspond to a single IP subnet. When we split VLAN using PVLANs, hosts in different PVLANs still belong to the same IP subnet, but they need to use router (another L3 device) to talk to each other (for example, by means of local Proxy ARP). In turn, router may either permit or forbid communications between sub-VLANs using access-lists. Why would anyone need Private VLANs? Commonly, this kind of configurations arise in “shared” environments, say ISP co-location, where it’s beneficial to put multiple customers into the same IP subnet, yet provide a good level of isolation between them. Promiscuous (“P”) port: Usually connects to a router. This port type is allowed to send and receive L2 frames from any other port on the VLAN. Isolated (“I”) port: This type of port is only allowed to communicate with “P”-ports – i.e., they are “stub” port. You commonly see these ports connecting to hosts. Community (“C”) port: Community ports are allowed to talk to their buddies, sharing the same community (group) and to “P”-ports. In order to implement sub-VLAN behavior, we need to define how packets are forwarded between different types of ports. We group the VLANs in “Primary” and “Secondary”. Primary VLAN (VLAN 1000 in our example). This VLAN is used to forward frames downstream from “P”-ports to all other port types (“I” and “C” ports) in the system. Essentially, Primary VLAN embraces all ports in the domain, but only transports frames from the router to hosts (from “P” to “I” and “C”). Secondary Isolated VLAN: forwards frames from “I” ports to “P” ports. Since Isolated ports do not exchange frames with each other, we can use just ONE isolated VLAN to connect all I-Port to the P-port. 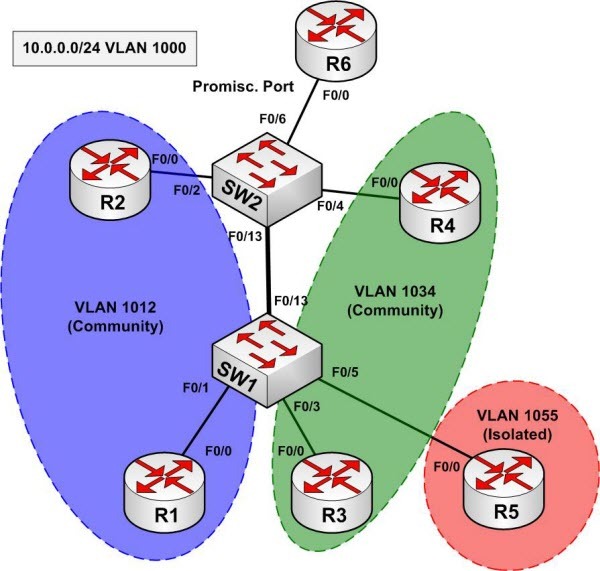 Secondary Community VLANs: Transport frames between community ports (C-ports) within to the same group (community) and forward frames upstream to the P-ports of the primary VLAN. The Primary VLAN delivers frames downstream from the router (promisc port) to all mapped hosts. The Community VLANs allow bi-directional frame exchange within a single group, in addition to forwarding frames upstream towards “P”-ports. Ethernet MAC address learning and forwarding procedure remain the same, as well as broadcast/multicast flooding procedure within boundaries of primary/secondary VLANs. Private VLANs could be trunked. The secondary VLAN numbers are used to tag frames, just as with regular VLANs, and the primary VLAN traffic is trunked as well. However, you need to configure Private VLAN specific settings (bindings, mappings) on every participating switch, as it’s not possible to use VTPv2 to disseminate that information. This due to the fact that VTPv2 has no TLVs to carry private VLANs information. VTPv3 was designed to overcome this limitation among others. We have primary VLAN 1000, Isolated VLAN 1005 (R5) Community VLAN 1012 (R1, R2) and Community VLAN 1034 (R3, R4).
! Isolated VLAN: Connects all stub hosts to router.
! Remember – only one isolated vlan per primary VLAN.
! In our case, isolates R5 only. This step is needed is to group PVLANs into a shared domain and establish a formal association (for syntax checking and VLAN type verifications). Repeat the same operations on SW2, since VTP has been disabled. Step 2: Configure host ports and bind them to the respective isolated PVLANs. Note that a host port belongs to different VLANs at the same time: downstream primary and upstream secondary. Also, enable trunking between switches, to allow private VLANs traffic to pass between switches. Step 3: Create a promiscuous port and configure downstream mappings. Here we add secondary VLANs for which traffic is received by this particular “P”-port. Primary VLAN is used to send traffic downstream to all “C” and “I” ports per their associations. If you need to configure an SVI on a switch to communicate with private VLAN members, you should add an interface corresponding to Primary VLAN only. Obviously that’s because all secondary VLANs are “subordinates” of primary. After an SVI has been created, you have to map the required secondary VLANs to the SVI (just like with a promiscuous port) in order to make communications possible. You may exclude some mappings from SVI interface, and limit it to communicating only with certain secondary VLANs. Now to verify the configuration, configure R1-R6 interfaces in subnet “10.0.0.0/24” and ping broadcast addresses. There is another feature, called protected port or “Private VLAN edge”. The feature is pretty basic and is available even on low-end Cisco switches. It allows isolating ports in the same VLAN. Specifically, all ports in a VLAN, marked as protected are prohibited from sending frames to each other (but still allowed to send frames to other (non-protected) ports within the same VLAN). Usually, ports configured as protected are also configured not to receive unknown unicast (frame with destination MAC address not in switch’s MAC table) and multicast frames flooding for added security.